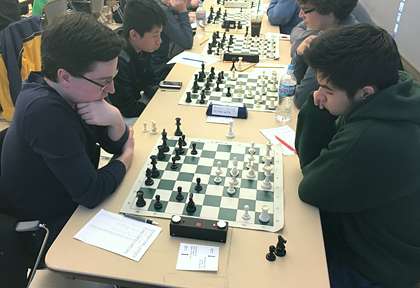 Evanston Chess provides relaxed, congenial chess to adults (high school and older). Some members like slow games, others prefer blitz. We offer rated play at our Saturday tournaments, and unrated play for adults at Tuesday night chess, where beginners are welcome. Membership is free. Our focus is on enjoying chess, not on prize money. Our club includes ages fourteen to over seventy, and players from beginners to masters. Open chess every Tuesday from 6:30-9:00 p.m. for players high school age and older. It's free. Boards and sets are supplied. The third Tuesday of each month we have blitz chess round robin for those who want to participate. We meet at: Levy Senior Center, 300 Dodge Ave., Evanston, IL 60201.